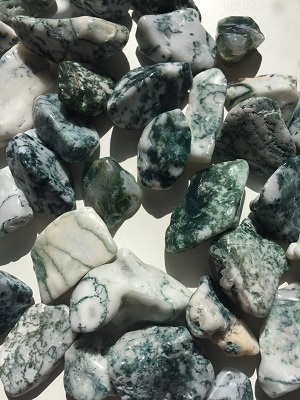 Beautiful green and white Tree Agate tumbled stones from India. 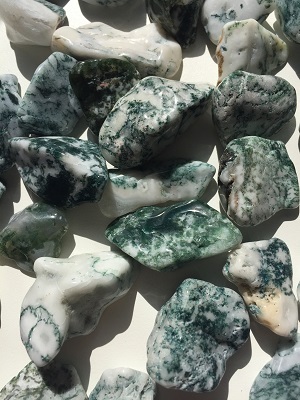 Beautiful green and white Tree Agate tumbled stones from India. Tree Agate is a stabilizing stone that instills a feeling of safety and security especially when faced with challenging situations. 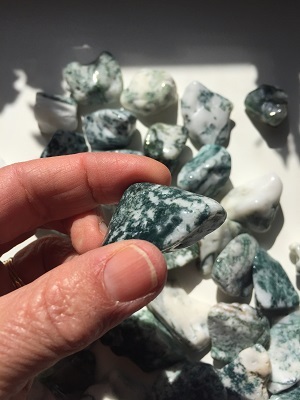 Tree Agate helps one realize the gifts that may be received from overcoming unpleasant circumstances. Tree Agate is a grounding stone that may be helpful in stabilizing physical energy. Tree Agate has a vibrant energy and reminds one of the cycles found in life. 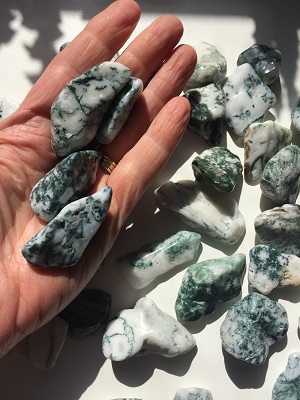 Tree Agate supports feelings of youthfulness, states of growth and renewal, and nature. Tree Agate harmonizes emotional states of being and helps to raise consciousness and awareness for all life forms. Tree Agate creates a powerful connection with the nurturing energy found in nature. Tree agate is an excellent earth healing stone for trees and plants. In healing, Tree agate is a powerful throat healer. Tree agate counteracts blocked self-expression releasing shoulder and neck problems, thyroid deficiencies, and throat and lymph infections. Tree agate offers healing for our skeletal system and supports treatments for arthritis, bone deformities and fractures.